Inflatables and Interactive Games – Our large selection of inflatable rides and attractions provide exciting fun activities for all ages to enjoy. From the moon bounce to giant themed slides, our inflatable attractions will be sure to be a hit at your next event. Our Interactive Game selection includes carnival rides as well as a large selection of carnival games including the classics like a milk- can- toss to our larger deluxe games that have multi-player options. Casino Parties – We are dedicated to making your casino party an overwhelming success! The WINNING combination of our expertise and authentic casino equipment is a “SURE BET” for a successful and most memorable evening. Our props and lighting have brought the thrill of Las Vegas to venues across the Mid-Atlantic. Whether you are planning a corporate fun event, gala fundraiser for a non-profit organization, holiday party or class reunion, our casino packages can give your guests an experience they’ll remember always. Fun Foods – Cotton candy, popcorn, and sno cones are just a few of our offerings for starters. We can also provide “State Fair Treats” like elephant ears, kettle corn and even fried Twinkies for your event! No matter if you just need the concession equipment or if you want a complete setup with staffing, we can delight the sweet tooth in all of your guests! Novelty Entertainment – Create a sports bar at your next event with our selection of Arcade Games available for your guests to enjoy. From Foos Ball to Pool Tables to Ping Pong Tables, we have a large selection of great games for you to choose from. Entertainers – DJ’s, palm readers, face painters, magicians, tattoo artists and celebrity impersonators are just a few of the entertainers we can provide for your next special event. Photography – There is no better way to preserve the memories from your event than with photography. 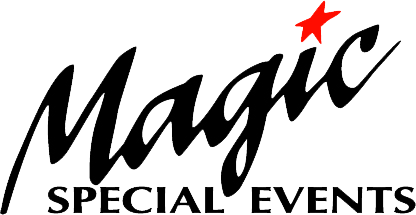 Magic Special Events has more than just one way to accomplish this. Photo booths, green screen photography and a host of other photographic activities and souvenirs are available for your event.